Baseball by the book intends to survey the landscape of baseball books both new and old. It will not be limited to works which have content directly related to the Toronto Blue Jays nor will it be limited to non-fiction. I believe a common first reaction to the news that Shi Davidi and John Lott would publish a book about the 2013 Jays was simply to ask why? Why revisit one of the most disappointing Jays seasons in recent memory? Davidi and Lott are arguably the best beat writers currently covering the Jays so nobody doubted their writing acumen but the whole concept seems like a bit of a tough sell to a frustrated fan base. Turns out that those fans may be surprised by the extent to which they will enjoy revisiting this season. For one thing you can’t really get too worked up about it when you already know how it ends. Furthermore, there’s an adage among beat writers that when you cover a team you tend to root for the story more than you root for the team. Nothing is more boring than the middle of the road. Truly great or truly awful seasons make the best stories so the sad truth for Jays fans is that 2013 has been the most book worthy Jays season in twenty years. The first few chapters of the book cover the off-season that preceded the 2013 season. This is the part of the book that will no doubt generate the most debate among fans trying to understand why things went so wrong for the team. Davidi and Lott remind us that the first order of business for Alex Anthopoulos that off season wasn’t the flashy trade with the Marlins but rather the whole business of dealing with manager John Farrell. The details of the growing rift between the two men paint a portrait that is far more sympathetic to Anthopoulos. We learn, for instance, that Farrell wanted to finish the 2012 season with Adeiny Hechavarria as his everyday shortstop while Anthopoulos wisely did not want to unnecessarily expose and devalue a potential trading asset. With the season lost and (Yunel) Escobar disgraced Farrell wanted to put prospect Adeiny Hechavarria in the lineup every day, preparing him for possible every day duty in 2013. Anthopoulos said no. Rival scouts had seen just enough of Hechavarria during a late-season call-up, he reasoned. By the time, Hechavarria did play in the majors for the Miami Marlins his limitations were indeed exposed vindicating Anthopoulos. The details of the trade that sent Hechavarria to the Marlins as related in this book should no doubt give pause to anyone questioning how the Blue Jays operate. The importance that Emilio Bonifacio, an exciting but ultimately one-dimensional and fundamentally unsound player, was given in the negotiations between the two teams remains a head scratcher to this day. Perhaps it’s fitting that the overrated Bonifacio ended up performing well below the predictions of even his harshest critics. As the book progresses through the trials of the 2013 season, the narrative is broken up by portraits of the men who played an important role. This is not unlike the formula Michael Lewis employed in his notorious, and to date only, baseball book, Moneyball. First we revisit John Gibbons’ first tenure as Blue Jays manager, a tenure almost completely overshadowed by two dramatic but uncharacteristic conflicts with players. We learn how Anthopoulos rather improbably ascended to the post of General Manager and how Jose Bautista became a magnet for criticism, how Mark Buehrle became such a unique pitcher, how a utility player from Japan’s ability to make people happy made him one of the bright spots of the season in the minds of both the players and the fans, how Arencibia’s awful season at the plate turned into a full blown media meltdown and how Mark DeRosa helped Brett Lawrie learn to channel his energy. Of these chapters, the one on R.A. Dickey struck me as the most interesting. Much has been made of what an intriguing person Dickey is but rather then rehash what we already know, Davidi and Lott focus on the extent to which Dickey does not conform to typical clubhouse culture and on the tension that can create. Dickey loves the baseball life and the opportunities it has afforded him and his family. He is a teammate, which requires a degree of cultural conformity. But he no longer worries about fitting in, about simply shutting up and pitching. 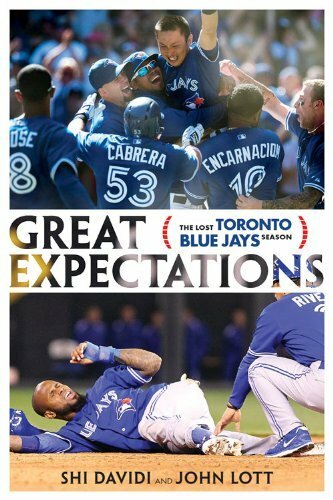 In the end, although Great Expectations provides some insight into what went wrong for the 2013 Jays, it won’t necessarily give any fans the smoking gun they might be looking for. Ultimately what it provides is a different kind of closure. It provides a reminder that the there are reasons why one can enjoy baseball that go beyond winning and losing. There are interesting stories and narratives that emerge for even the worst season. Reading Great Expectations will make you realize that you miss watching the Jays, even their frustrating 2013 version. Could Casey Janssen Net A Compensation Pick? André is a lifelong Atlantic Canadian who has studied French literature and Library Science. Growing up in the eighties, he and his brother split their allegiances among the two Canadian franchises in Major League Baseball. For the sake of his lifelong love of the game, it's probably best that André's team was the Toronto Blue Jays. Your right Andre, I didn’t think I would have liked reading a book about 2013 again, but I loved it. I think they could have passed on regurgitating some stuff on Dickey which was already in his own book and present some new stuff on him. Also having a chapter on JJ or Melky would’ve been good to include but they didn’t. Overall though, a good read.